Folks like you are the reason Hearing Health Foundation (HHF) has just completed its 60th anniversary year of groundbreaking work toward better treatments and permanent cures for hearing loss and tinnitus. Your donations make it possible. Tinnitus and hearing loss, respectively, are the number one and number two disabilities reported by returning American military personnel. Thank you for everything you do. Living with noise-induced hearing loss and tinnitus following 26 years of service in the U.S. Army, I strongly share your desire for more scientific developments — both to restore hearing and to prevent its loss. Every person serving on our Board of Directors is also connected to a hearing disorder in some way and shares our passion for progress. It is coming. As each year passes we learn more and more about key processes in the brain and auditory system. We’re grateful for these discoveries that bring us closer to hearing regeneration in adult mice (as human proxies for now), and toward new treatments for tinnitus, Ménière's disease, and related conditions. But we know more must be accomplished for all of us to enjoy a better quality of life. Your generosity can make possible the discoveries we — our veterans, our parents, our children, our spouses, our friends — urgently need. Please, if you are able, give today to HHF to fund more innovative scientists in 2019-2020 and accelerate much-needed treatments and cures. HHF will direct 100% of your gift toward the program your choose — Hearing Restoration Project (HRP), Emerging Research Grants (ERG), Ménière's Disease Grants (MDG), or Education. Thank you for your consideration and for being part of our mission. Every Veterans Day, Hearing Health Foundation (HHF) celebrates the brave individuals who have served and sacrificed to defend our country. We are grateful to our active military members and veterans for their courageous protection of American values and freedoms. As we honor those who have served in the U.S. Armed Forces, we acknowledge a tragic and troubling health problem. An astounding number of veterans—60% of those returning from Iraq and Afghanistan—live with tinnitus and noise-induced hearing loss. In 2017, the Veterans Administration reported 1.79 million disability compensation recipients for tinnitus and 1.16 million compensation recipients for hearing loss, the number one and two disabilities, respectively. In an HHF video about hearing loss treatment, Retired Army Colonel John Dilliard, Chair-Elect of HHF’s Board of Directors, explains, “The noise from repeated gunfire and high-frequency, high-performance aircraft engines takes its toll on the human hearing mechanisms.” Col. Dillard lives with both tinnitus and hearing loss following 26 years of service. John Dillard and fellow soldiers, Fort Irwin National Training Center, 1977. Dr. Bruce Douglas, 93, remembers the moment his hearing became severely compromised while serving in the Navy during the Korean War. “On what was my 26th birthday, after pulling the trigger on the M1 rifle with no protection (none of us had any) multiple times, I was left with tendonitis in both knees—and worse, permanent, chronic tinnitus due to acoustic trauma. My hearing went downhill ever after, and every imaginable kind of sound and sensation has resulted from my tinnitus,” Douglas writes in the Fall 2018 issue of Hearing Health. Hearing protection training must start as soon as one enters the military. But there is a misconception that hearing protection inhibits vital communication and mission readiness because hearing signs of danger is imperative to survival. “Soldiers want to be able to hear the snap of the twig and want to be able to be situationally. As a result, they are often resistant to wearing hearing protection,” Col. Dillard says. Fortunately, sophisticated hearing protection technology does exist so that military personnel do not have to choose between protecting their ears or their lives. Examples include noise-attenuating helmets, which use ear cups to protect against hazardous sound, and Tactical Communication and Protective Systems, which protect against loud noises while amplifying soft ones. The U.S. military continues to work toward safer hearing in the service. The U.S. Army has developed the Tactical Communication and Protective System (TCAPS), which are earbuds that dampen dangerous noises to safe levels using microphones and noise-canceling technology, while also providing amplification of softer sounds and two-way communication systems. An initiative by the U.S. Air Force called Total Exposure Health (TEH), meanwhile, focuses on overall health both on and off the job, will measure cumulative noise exposure over the course of 24 hours. These developments and others, which HHF applauds, are covered in greater detail in Hearing Heath’s Fall 2017 issue. As greater preventative technology for our military becomes available, HHF remains dedicated to finding better treatments and cures for tinnitus and hearing loss to benefit the lives of millions of Americans, including veterans, a disproportionately affected group. We hope you will join us in remembering their sacrifices with gratitude and compassion. I am a 93-year-old healthy adult with hearing loss. Many parts of my body don’t work perfectly right anymore, but my hearing loss is my biggest physical difficulty. When it comes to hearing loss, I’ve been there and done that. Despite the fact that I am legally deaf, I can hear. Why? Because I’ve stubbornly fought back every time a hearing pitfall appeared in my path. The reason I can hear is because I refuse to give into my disability. I try out every kind of useful assistive hearing device I can lay my hands on or is given to me by my Department of Veterans Affairs (VA) audiologist. I’ve become a hearing loss activist and fight for coiling of public facilities whenever I have the chance to do so. And I recently had a cochlear implant installed about a year ago. As a boy, I remember always taking a seat at the front of the room, when most other kids would vie for one in the back, so they could cheat on exams without being seen by the teacher. I didn’t realize how poor my hearing was until I was reprimanded for inconspicuously (I thought) using a nail clipper under my desk in my elementary school classroom. I had no idea because I couldn’t hear it! I tried to come to terms with my hearing loss for many years. I refused to hide in corners of rooms and restaurants, and dealt with my problem largely by disclosing my hearing loss to people and asking for their cooperation in our verbal relationships. My early hearing aids only allowed me to hear sounds but not comprehend them, so I learned to lip read and stare at my companions, often to the point of distraction. I have presbycusis, I’m suffering from acoustic trauma from my time in the Korean War, I have sensorineural deprivation, and I’ve experienced every imaginable kind of sound and sensation in the form of tinnitus. Call us what you will, but don’t ignore us; don’t make fun of us. Most importantly, respect us; and treat us as equals. Be patient with us and accept the reality that we have an invisible condition that wove its way into our nervous system, most often beyond our control, and we do all we can to listen to you and respond to the best of our ability. Dr. Bruce Douglas is a Professor of Health and Aging at the University of Illinois at Chicago School of Public Health. He is a participant in HHF’s Faces of Hearing Loss campaign. April 25 is International Noise Awareness Day, an annual, vital reminder to take a stand against noise exposure and to spread awareness about the underestimated threat of noise-induced hearing loss (NIHL). Seemingly harmless rhythms, roars, and blasts heard daily from music, trains, and machinery are, in fact, among the top offenders of NIHL. Noise-induced hearing loss (NIHL) progressively occurs after chronic exposure to loud sounds. The frequency and intensity of the sound level, measured in decibels (dB), increases the risk of NIHL. Gradual hearing loss can result from prolonged contact with noise levels of 85 dB or greater, such as heavy city traffic. Noises of 110 dB or more, like construction (110 dB), an ambulance (120dB), or the pop of firecrackers (140-165 dB) can damage one’s hearing in a minute’s time. NIHL is the only type of hearing loss that is completely preventable, yet billions of individuals endanger themselves daily. Over 1.1 billion young adults ages 12 to 35—an age group that frequently uses headphones to listen to music—are at risk. Already, an estimated 12.5% of young people ages of 6 to 19 have hearing loss as a result of using earbuds or headphones at a high volume. A device playing at maximum volume (105 dB) is dangerous, so exposure to sounds at 100 dB for more than 15 minutes is highly discouraged. Most major cities around the world have transit systems that put commuters in contact with sounds at 110 dB. BBC News found that London’s transit systems can get as loud as 110 dB, which is louder than a nearby helicopter taking off. The sound levels of some stations exceed the threshold for which occupational hearing protection is legally required. New York City has one of the largest and oldest subway systems in the world where 91% of commuters exceed the recommended levels of noise exposure annually. In a study on Toronto’s subway system, 20% of intermittent bursts of impulse noises were greater than 114 dB. People who work in certain fields are more vulnerable to NIHL than others. Professional musicians, for instance, are almost four times as likely to develop NIHL than the general public. Military personnel, who are in extremely close proximity to gunfire and blasts, are more likely to return home from combat with hearing loss and/or tinnitus than any other type of injury. And airport ground staff are surrounded by high-frequency aircraft noises at 140 dB. In all of these professions, the hazard of NIHL can be significantly mitigated with hearing protection. NIHL is permanent. Increased exposure to excess noise destroys the sensory cells in the inner ears (hair cells), which decreases hearing capacity and leads to hearing loss. Once damaged, the sensory cells cannot be restored. To find a solution, Hearing Health Foundation’s (HHF) Hearing Restoration Project (HRP) conducts groundbreaking research on inner ear hair cell regeneration in hopes of discovering a life-changing cure. Nearly three-quarters of those who are exposed to loud noises rarely or never use hearing protection. It is our dream that someday, NIHL will be reversible as a result of the HRP. Until then, to make noise safer, HHF advises protection by remembering to Block, Walk, and Turn. Block out noises by wearing earplugs or protective earmuffs. Walk away or limit exposure to high-levels of noises. Turn down the volume of electronic devices. This April, Hearing Health Foundation (HHF) draws your attention to Auditory Processing Disorder (APD), a condition that causes impairments in sound localization—the ability to identify sound sources—and has been closely linked to autism. April 4 is recognized as APD Awareness Day in some regions of the U.S. and April is Autism Awareness Month nationwide. APD occurs when the central nervous system has difficulty processing verbal or auditory information, specifically in noisy, social environments. Individuals with APD do not necessarily have a diagnosed hearing loss; in fact, many have normal audiogram results. With APD and typical hearing, the inner ear properly sends signals to the brain, but, once received, the brain fails to interpret and analyze these sounds accurately, resulting in jumbled messages. In the U.S., it is estimated five percent of school-age children, or 2.5 million children, have APD. Individuals with APD are often unable to hear sounds as words and have learning problems, including difficulty in reading, spelling, and language comprehension. It is vital to review the symptoms, demographics, and treatments of APD, should you suspect it in yourself or a loved one. Individuals with APD have trouble distinguishing between words or syllables that sound alike (auditory discrimination) and recalling what they heard (poor auditory memory). They show delayed responses to verbal requests and instructions and will often ask someone to repeat what has been said. APD is commonly misdiagnosed as ADD/ADHD, dyslexia, or hearing loss. Demographically, APD is a common secondary diagnosis for children with autism; most children diagnosed with autism have auditory processing disorders or auditory difficulties. HHF Emerging Research Grants (ERG) recipient Elizabeth McCullagh, Ph.D.’s 2017 published work in The Journal of Comparative Neurology examines the strong connection between Fragile X Syndrome (FXS), the most common genetic form of autism, and difficulties with sound localization. Additionally, APD is prevalent in individuals with neurological problems, including those who have experienced head injuries or strokes. Older adults, who are more susceptible to some cognitive decline, are also at greater risk for APD. Military veterans who have been repeatedly exposed to blasts are another community disproportionately affected by APD. An estimated 15% of all returning military personnel live with APD. HHF’s ERG recipient Edward Bartlett, Ph.D., explains that the changes to the central auditory system may account for the behavioral issues that veterans experience, such as problems with memory, learning, communication, and emotional regulation. Much more research of APD is needed to improve the accuracy of methodologies for diagnosis and to determine the best interventions for each child or adult. Even though there are available strategies to treat APD, researchers, including those funded by HHF, largely through the generosity of the Royal Arch Masons Research Assistance, are hard at work finding alternative treatments that will improve the lives of those with APD. Hearing Health Foundation (HHF) recently welcomed COL John T. Dillard, USA (Ret) to its Board of Directors. A Cold War Veteran, COL Dillard lives with tinnitus and hearing loss—the two most common war injuries—as a result of repeated exposure to gunfire and blasts. COL Dillard is currently a Senior Lecturer for Systems Acquisition Management at the Naval Postgraduate School (NPS) in Monterey, California, where he has been employed since his retirement from the U.S. Army in 2000. His curricula focus on system developments to advance technology and warfighting capabilities. At the NPS, COL Dillard also counsels young military officers as they cope with the effects of tinnitus including sleep, concentration, and mood issues. Previously, COL Dillard held positions as an instructor at the U.S. Army War College and an adjunct professor at the University of California at Santa Cruz. In the latter, he educated Silicon Valley public and private industry professionals in Project Management. The full-text versions of his own many written works on managing technology efforts are available on ResearchGate. In addition to his present role at the NPS, COL Dillard is a Defense Department Consumer Reviewer for the annual Congressionally Directed Medical Research Program for scientific proposals in the areas of tinnitus and noise-induced hearing loss research. COL Dillard says that he "hopes to contribute in a tangible way to HHF’s drive to restore hearing for countless people affected by its loss." On behalf of folks like John—Thank you for your continued support of Hearing Health Foundation (HHF), the largest U.S. nonprofit funder of hearing loss and tinnitus research in America. We are dedicated to discovering better treatments and permanent cures. John—a Retired U.S. Army Colonel—served during the Cold War. Constant exposure to gunfire and high-pitched helicopter engines took a toll on his hearing. He was diagnosed with tinnitus and hearing loss in 1996. His diagnosis fueled his desire to improve the lives of active duty personnel and veterans since. Tragically, John's circumstances are not unique. Tinnitus is the most common physical ailment for returning military personnel, followed by hearing loss. 60% of Iraq and Afghanistan veterans suffer from one or both of these conditions. Many Veterans, even those who pass their hearing test, have trouble understanding speech. This condition, known as auditory processing disorder, is often caused by blast exposure. Today John teaches at the Naval Postgraduate school where he often counsels young military officers as they cope with their tinnitus, as tinnitus can cause significant sleep, concentration, and mood issues. Can you help bring us closer to better treatments and cures for tinnitus for John and the 65 million other Americans with tinnitus, many of whom are also veterans? PLEASE, IF YOU ARE ABLE, GIVE TO HHF TODAY. 100% OF YOUR GENEROUS GIFT WILL BE DIRECTED TO THE AREA OF YOUR DESIGNATION. Each year on Veterans Day, November 11, we proudly honor the men and women who have bravely served our country and fought to protect our freedoms. Veterans Day is important because it honors our soldiers and it is a time to raise awareness about their experiences on and off the battlefield. Noise-induced hearing loss (NIHL) and tinnitus (ringing in the ears) are the top two health conditions among military veterans, according to the U.S. Department of Veterans Affairs (VA). By the end of fiscal year 2016 over 1 million veterans received disability compensation as a result of hearing loss, and about 1.6 million received compensation for tinnitus. In addition to being disproportionately affected by hearing loss and tinnitus, our soldiers and veterans are also more susceptible to developing central auditory processing disorders (CAPD). CAPD occurs when one can hear sounds but is unable to understand the words. It is sometimes caused by intense exposure to sudden and loud noises from improvised explosive devices (IEDs), ammunition and engine noise. Blasts can result in temporary hearing loss and put military personnel at risk. However, the word “temporary” should be approached with caution: Repeated short-term hearing loss can damage the sensitive hair cells in the inner ear, leading to permanent hearing loss. Hearing loss and tinnitus as a result of noise is largely preventable. There’s a misconception that not using hearing protection would inhibit vital communication and mission readiness. With today’s increasingly sophisticated technology, soldiers no longer need to choose between protecting their ears or their lives. Wearing hearing protection such as noise-attenuating helmets, which use ear cups to protect against hazardous sound, or Tactical Communication and Protective Systems, which protect against loud noises while amplifying soft ones, can go a long way to reduce overall exposure, while ensuring vital communications. Any form of hearing loss can be detrimental to soldiers on duty, as the ability to hear signs of danger and to communicate with fellow soldiers is crucial for mission success and survival. Off-duty, hearing loss and tinnitus can also impact one’s well-being. Regardless of age, type of hearing loss, or cause, if left untreated or undetected hearing loss can lead to considerable, negative social, psychological, cognitive, and health effects. As a result, it can seriously impact professional and personal life, potentially leading to isolation and depression. Treating hearing loss can also decrease one’s risk of acquiring other serious medical conditions, such as cardiovascular disease, dementia, and diabetes. Veterans who have acquired hearing loss and tinnitus, either as a result of war or through other causes, can seek treatment at their local Department of Veterans Affairs (VA) medical center. Through partnerships with local community providers, the VA offers comprehensive hearing health services including screening, evaluation, treatment, and/or management of hearing, tinnitus, and balance disorders. While it may be daunting to take the initial step of having a hearing test, it is important to know there are many different treatment options available. Some forms of hearing loss, such as those that affect the middle ear, are treatable through surgery. Damage to the inner ear and auditory nerve can cause permanent hearing loss; however technologies such as hearing aids, assistive/alerting devices, TV and telephone amplifiers, and cochlear and other auditory implants can optimize residual hearing by amplifying sounds. As for tinnitus treatments, many patients have seen improvements with counseling and sound therapy, cognitive behavioral therapy (CBT), and the use of white-noise machines. Be sure to discuss the cause of your hearing loss and tinnitus and various treatment options with your audiologist or ear, nose, and throat specialist (ENT). “On this and every Veterans Day, HHF sincerely thanks our military and our veterans for their brave service and sacrifice. I would also encourage all members, past and present, to have their hearing tested and monitored by a hearing health professional on a regular basis.” —Nadine Dehgan, CEO, Hearing Health Foundation. Please visit va.gov/directory/guide to find your local VA medical facility. Please also see our Fall 2017 issue of Hearing Health magazine, whose theme is Veterans & Seniors, available at hhf.org/magazine. 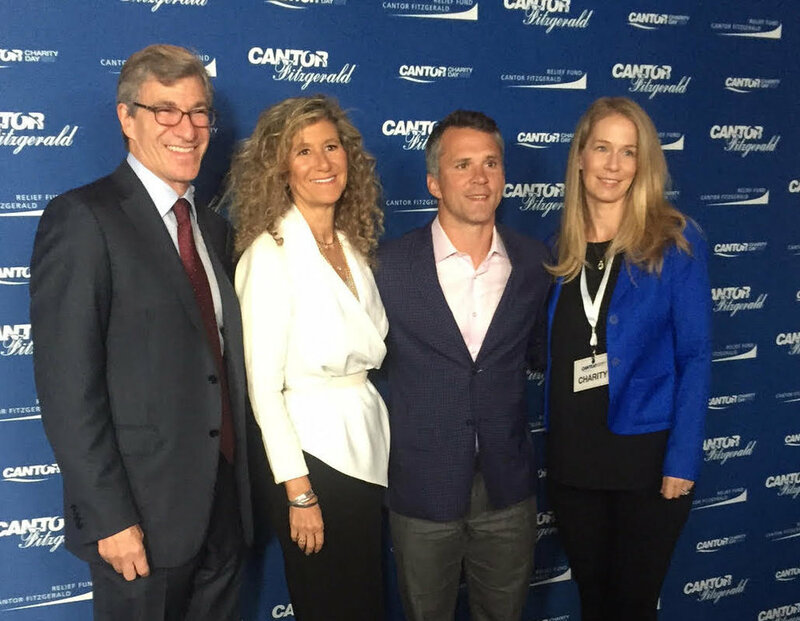 Hearing Health Foundation (HHF) was among the dozens of charities selected to participate in yesterday’s Cantor Charity Day—an annual, celebrity-filled philanthropic event held around the anniversary of September 11—at Cantor Fitzgerald’s New York City headquarters. HHF’s attendance marked the organization’s fifth year of participation. HHF was represented by Hockey Legend Martin “Marty” St. Louis, HHF Board member Paul Orlin, and Nadine Dehgan, HHF’s CEO. As Marty’s own foundation has supported HHF’s life-changing hearing and balance research in the past, HHF was especially thankful that he also dedicated his time to serve as an ambassador. The HHF trio had a particularly memorable encounter with Robert De Niro and another hockey star, Mike Richter, who were also among Charity Day’s celebrity roster. Marty told Mr. De Niro that in his days as a player (for Tampa Bay Lighting, Calgary Flames, and the New York Rangers), he impersonated De Niro’s film roles in the locker room to energize his teammates before big games—and the movie star found that amusing. All proceeds from Cantor Charity Day will benefit the Cantor Fitzgerald Relief Fund, which aids the families of the firm’s 658 employees who perished in the World Trade Center attacks. Since its 2001 establishment, the Relief Fund has expanded its reach to also support victims of terrorism, natural disasters, and emergencies, wounded military personnel, and other charitable causes worldwide, including HHF. The Fund’s prioritization of wounded veterans is especially compatible with HHF’s work; tinnitus and hearing loss are the most common disabilities that afflict returning American military members. “HHF will use the funds received from this event to continue to be a resource for veterans with hearing loss and to further research for treatments and cures for the 360 million people around the world who have hearing loss,” Nadine pledges. May 20 is Armed Forces Day and Hearing Health Foundation is paying tribute to the men and women who serve in our armed forces. The number one and two war wounds for active service members and veterans are hearing loss and tinnitus, directly impacting their ability to conduct missions and follow instructions. According to the U.S. Department of Veterans Affairs, by the end of 2014 over 933,000 veterans received disability compensation as a result of hearing loss, and about 1.3 million received compensation for tinnitus. Extended, unprotected exposure to noise that reaches 85 decibels (the sound of a lawnmower) or higher can cause permanent inner ear damage. The Centers for Disease Control and Prevention (CDC) states difficulty with hearing is the third most commonly reported chronic health condition in the U.S.; approximately 40 million Americans ages 20 to 69 have hearing loss in one or both ears, and one main cause is excessive, loud noise. When it comes to hearing loss and tinnitus, soldiers are at an increased risk. They are susceptible to noise-induced hearing loss (NIHL) because they are exposed to loud machinery and explosions on a constant basis. In combat, soldiers are often exposed to sudden noises, such as from an improvised explosive device (IED) or other similar weapon, which are difficult to predict and be protected against. These sudden noises can result in temporary hearing loss and put military personnel at risk. However, the word “temporary” should be approached with caution. Repeated short-term hearing loss can damage the sensitive hair cells in the inner ear, leading to hearing loss that becomes permanent. Hearing loss as a result of noise is 100 percent preventable. Wearing hearing protection such as noise attenuating helmets, which use ear cups to protect against hazardous sound, or Tactical Communication and Protective Systems (TCAPS), can go a long way to reduce overall exposure. Since these brave men and women are disproportionately impacted by hearing loss and tinnitus that likely affects many other aspects of their lives, Hearing Health Foundation is proud to pay tribute to them on Armed Forces Day. If you are a veteran, current service member, or have family or friends who have bravely served our country, please check out our veterans' resources and share your story about hearing loss or tinnitus with us.